Comprehensive 2D-LC requires excellent performance from each component. For example, the 2nd-dimensional separation system requires ultra-first gradient analysis with a high flow rate and ultra-high pressure. Moreover, in order to analyze differences between samples, excellent retention time reproducibility is required under such analytical conditions. Nexera-e is designed to meet and exceed such exacting requirements with its high-performance Nexera X2 components. For example, the solvent delivery unit, LC-30AD, provides solvent delivery at a flow rate up to 3 mL/min with a pressure limit of 130 MPa. In addition, the ultra-high-pressure switching valve, FCV-32AH, has a pressure limit of 130 MPa. 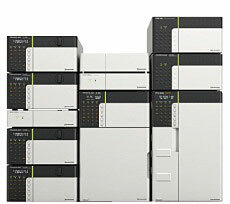 Such excellent performance expands the range of selection of 2nd-dimensional analytical conditions. The Nexera-e incorporates a Shimadzu designed low-volume switching valve. Comprehensive 2D-LC requires frequent valve switching. Some valve systems may exhibit clogging issues due to abrasion powders. Using the robust technology developed for the Nexera X2 autosampler, this potential problem has been significantly minimized. Ultra-high speed analysis of comprehensive 2D-LC also requires ultra-high-speed data sampling. The Nexera X2 photo-diode array detector, SPD-M30A, has a high sampling rate up to 200 Hz, while the LCMS-8050 triple quadrupole liquid chromatograph mass spectrometer features ultra-high speed data scanning by employing UF-MS technologies to enable superior data acquisition.